On their own, pranksters Miles and Niles were pretty devious. Now that they've formed a pranking duo, they're terrible But their powers will be tested when their favorite nemesis, Principal Barkin, is replaced by his stern and cunning father, Former Principal Barkin. Now Miles and Niles will do just about anything to get their old antagonist back--including pranking alongside him. 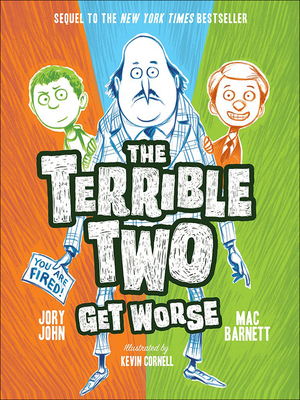 Authors Mac Barnett and Jory John "are in perfect comic harmony" (Publishers Weekly) in this series that celebrates inventiveness, friendship, and the power of teamwork--for good, or for terrible. Mac Barnett's bestselling children's books include the 2013 Caldecott Honor Book Extra Yarn. He lives in Berkeley, California. Jory John writes picture books and coauthored the bestselling All My Friends Are Dead. He lives in Portland, Oregon. Kevin Cornell is the illustrator of many children's books. He lives in Philadelphia.